Available on iOS, Android and on the Web. Homebase is a comprehensive building management and modern living solution, for managers and residents. 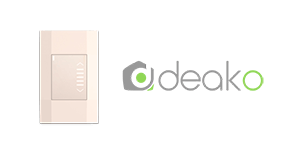 We merge property-wide connectivity, community driven tools and intelligent building automation to help you create and manage the modern living experience that renters desire. 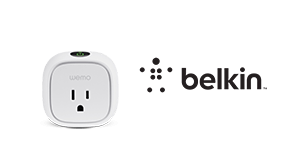 Our building wide WiFi and Bluetooth Mesh network connects and powers all the devices and systems in your building, while providing a revenue generating internet access program for you residents and the ability to easily upgrade your building so it’s always ready for what’s next. 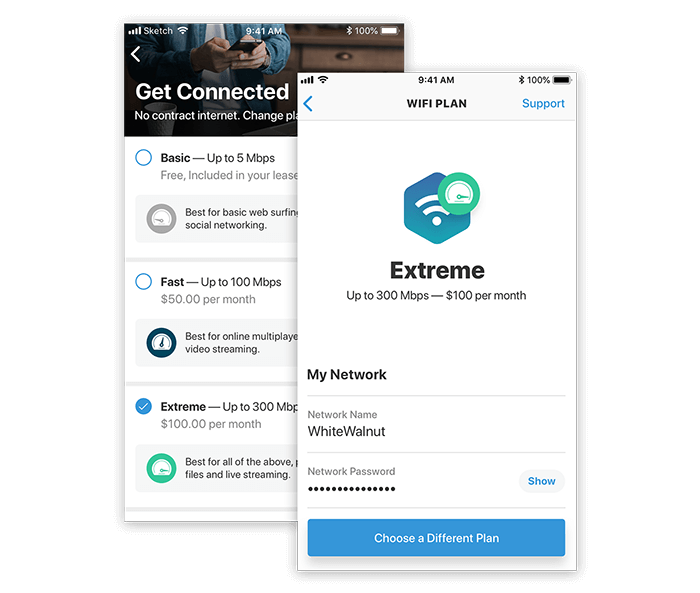 This managed Wifi as a service network also provides a tiered bandwidth resident internet access program where residents purchase their internet from the property owner instead of a carrier, generating incremental revenue for property managers. 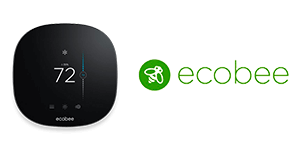 Bluetooth mesh networking enables many-to-many smart devices to communicate, optimizing for creation of large-scale device networks. This allows for building automation, sensor networks, asset tracking, and other IoT solutions that require tens, hundreds or thousands of devices to communicate with one another. 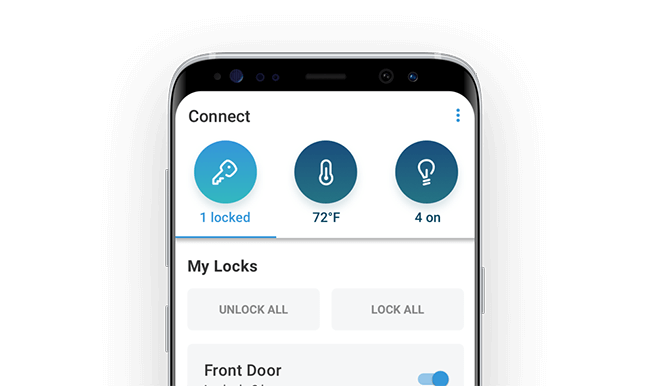 By connecting all of your property’s smart home devices and automated building systems, we help you give residents the modern, sophisticated living experience they desire while making management simple and seamless. 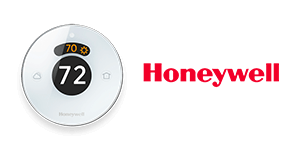 Homebase automation allows property managers to do more with less. Keys are among the most commonly misplaced items. 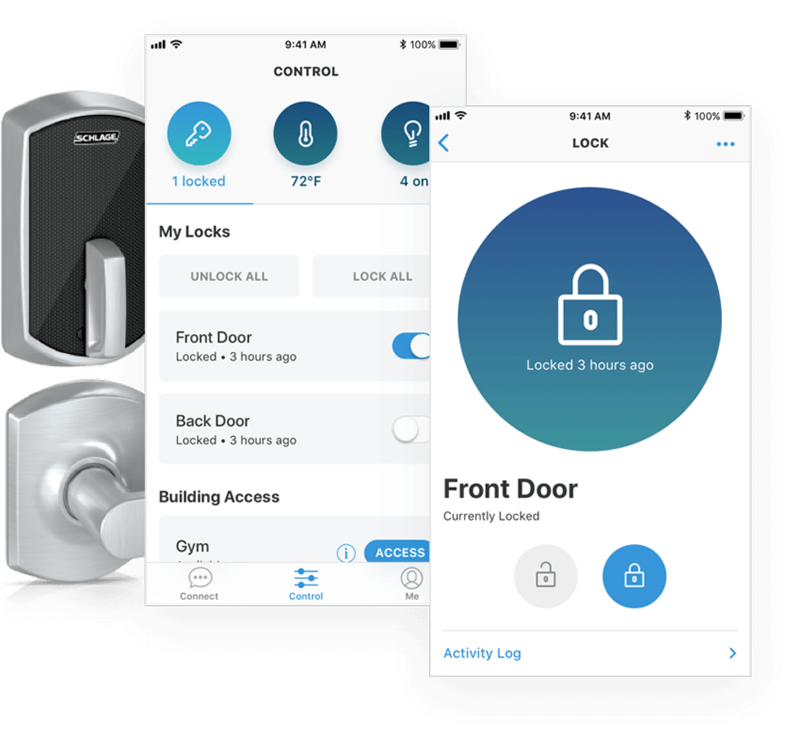 To prevent lockouts and increase convenience, smart locks allow residents and staff to remotely lock/unlock doors via smart phone and web. Maintenance staff can receive a temporary key to enter a unit, notifying each resident exactly when they’ve entered their unit. 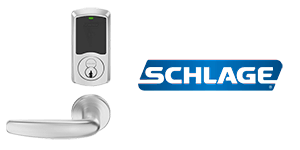 Increase building security and convenience by implementing Smart Access control. 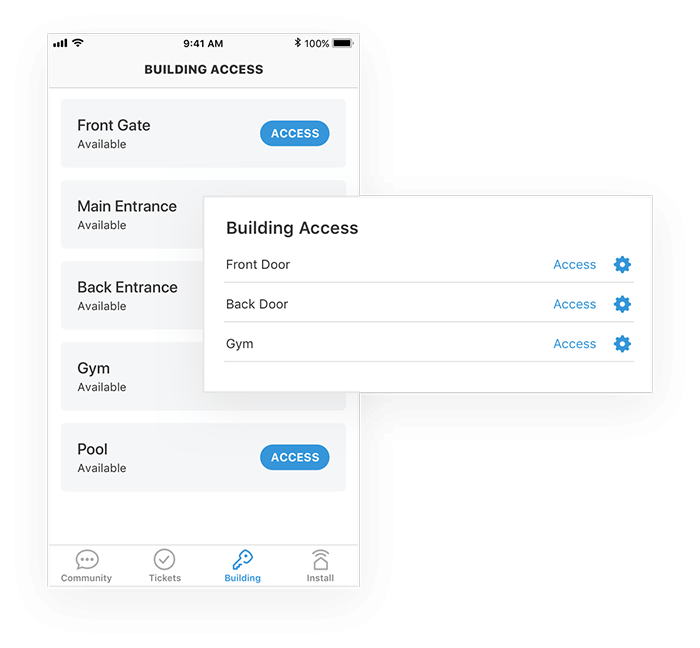 Give residents and staff remote access to building entryways and doors, and track who is coming and going across the entire property. Heating and cooling account for nearly half of your property’s energy costs. 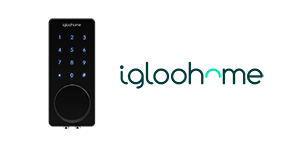 Stay energy efficient in vacant units and give residents the ability to control their climate remotely. Staff can monitor resident unit temperatures to ensure unit climates aren’t out of the ordinary. 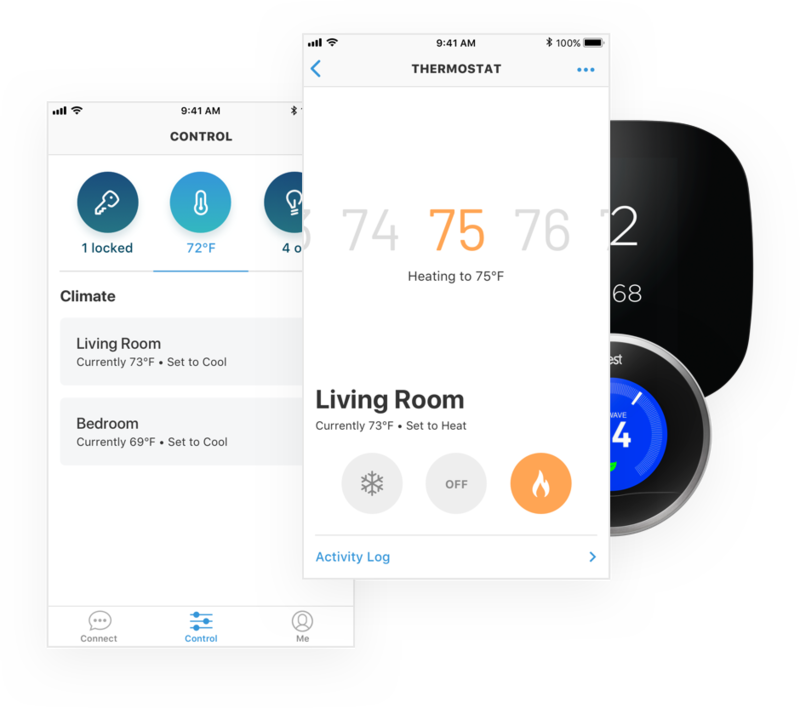 Manage emergencies with HVAC and maintenance notifications, all while providing a green living experience. 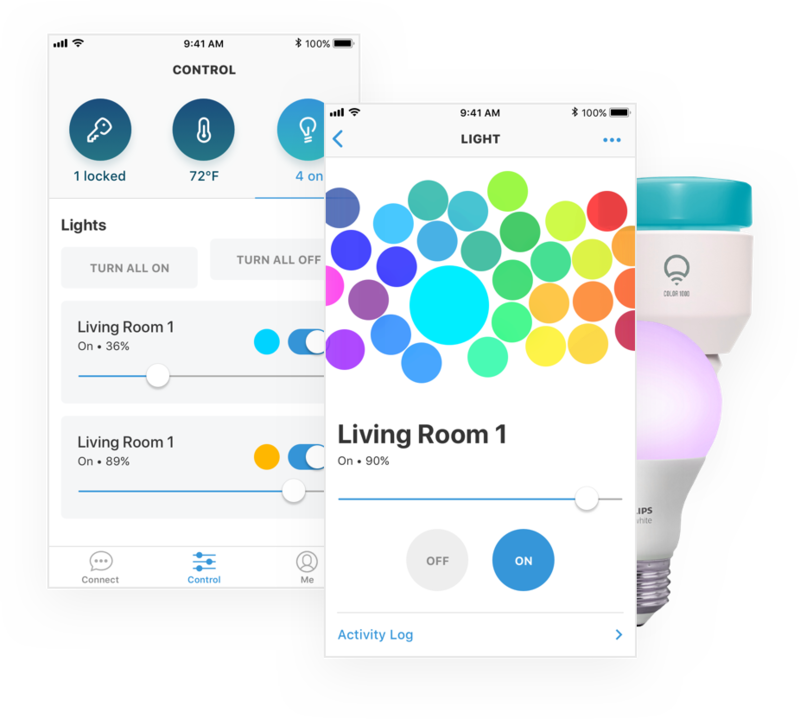 Lighting is an integral part of smart home systems where automation can deliver great benefits. 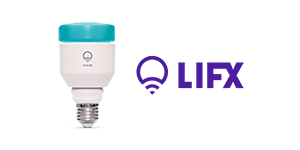 Give residents and staff the ability to control lights remotely to enhance security and conserve energy. Manage lighting in vacant units and quickly set the mood for resident tours. 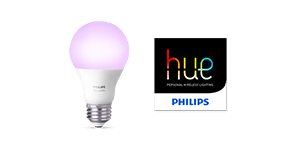 Smart lighting allows for numerous colors and settings, an exciting amenity for your residents to brag about. 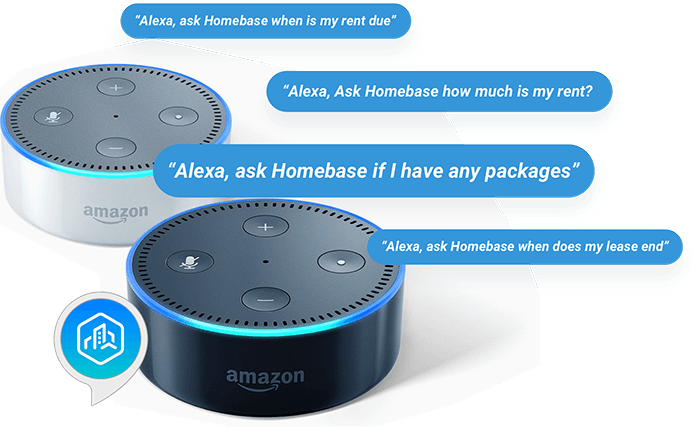 Give residents the amenity of smart voice control throughout their unit using Amazon Alexa. 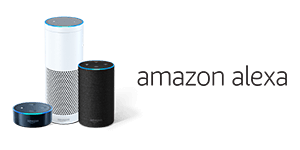 Access all of Alexa’s skills, such as Amazon Streaming Services, NPR News, Pandora Radio, Audible, and even Homebase. “Ask Homebase, what’s my address? “Ask Homebase, what’s the maintenance phone number? Homebase as the ability to integrate with many current platforms, ensuring all of your property management tools work together. Seamless communication between property managers and residents ensures you never miss you residents needs, wants and requests. Homebase creates connections between residents, property amenities, community activities and living services resulting in a community and living experience residents never want to leave. 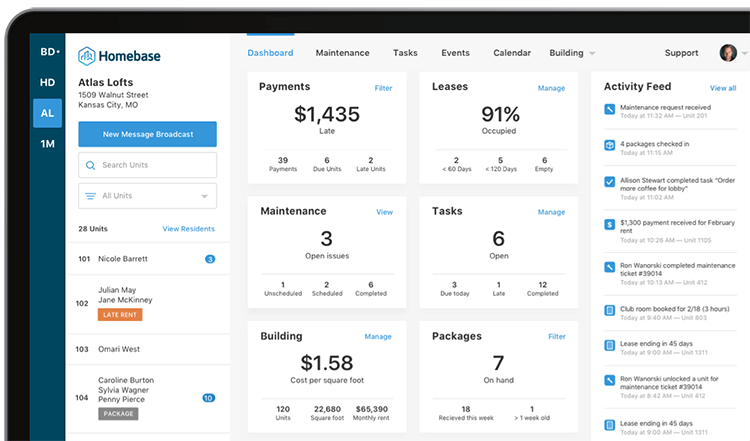 The Dashboard provides a real-time snapshot of your building’s overall health, while the Activity Feed gives the pulse of everything happening in your community. 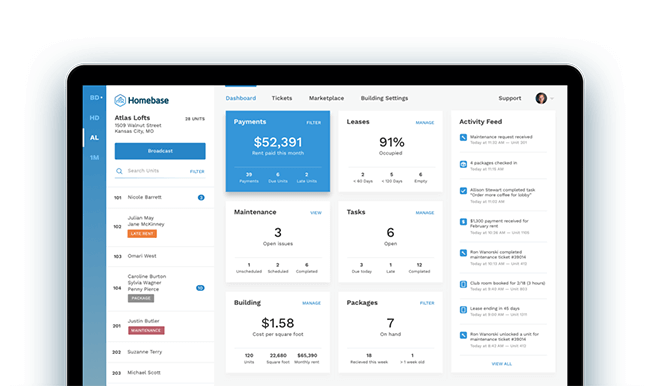 For Homebase 2.0, our team combined the Dashboard and Activity Feed to help you stay up-to-date with the details that drive resident happiness, retention and net operating income. 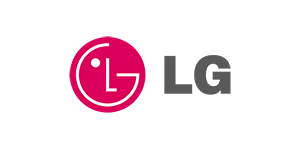 See the latest maintenance requests, payments, device interactions and more. Streamline communication with residents and team through instant messaging. 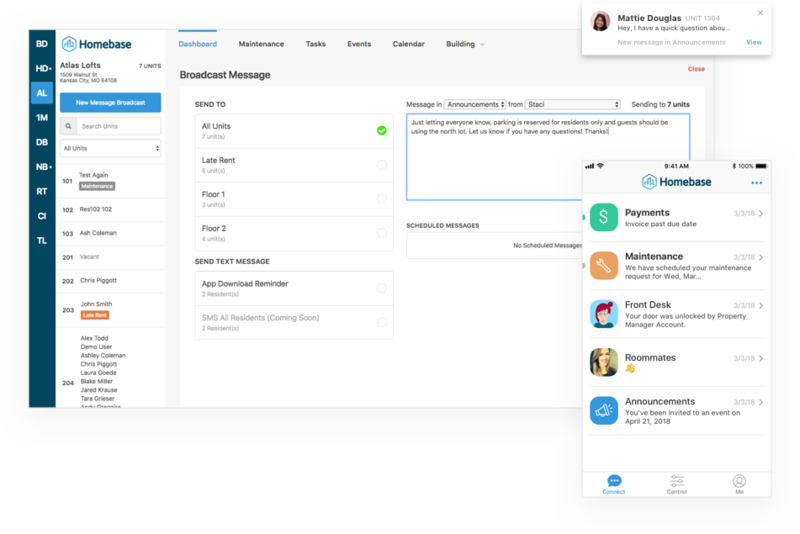 Send broadcast messages to several units at once, or message a unit directly through specific Front Desk, Payment, Maintenance and Announcement channels. 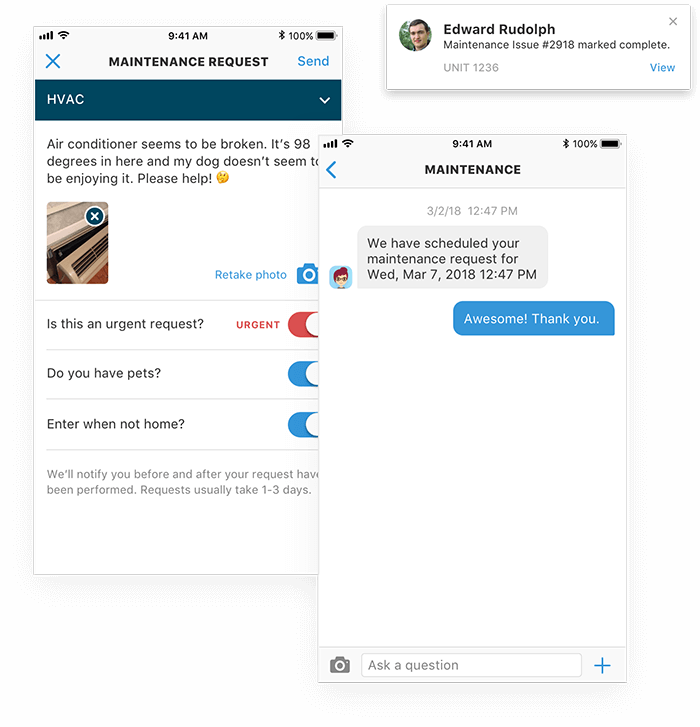 Allow maintenance staff to ask questions immediately, and give units with multiple residents a way to communicate with each other privately through the Roommates channel. 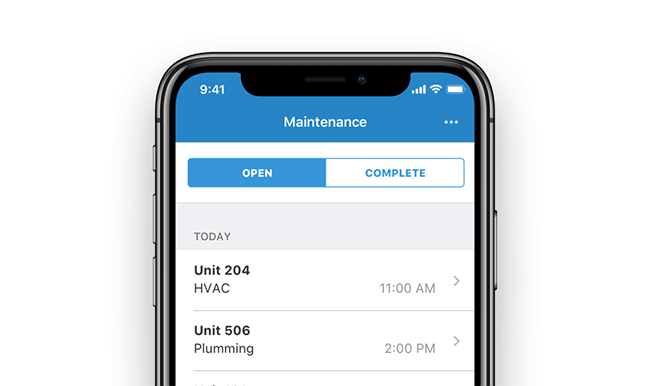 Give your residents the ability to quickly submit maintenance requests, and give staff the ability to manage and assign tickets. 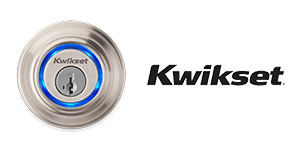 Through smart locks, maintenance staff can be assigned a digital key to enter a unit, and all parties involved are notified upon entry and maintenance competition. Take the stress out of collecting one-time and monthly rent payments. 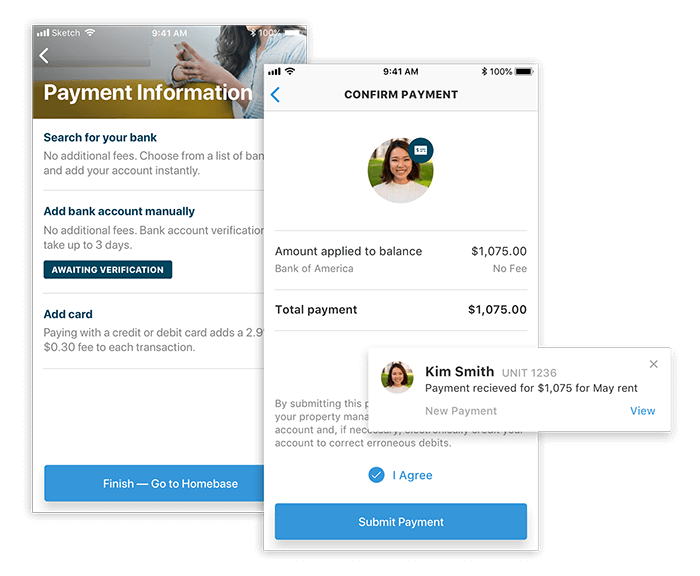 With free digital payments through Homebase, residents can pay for their rent with the tap of a button. Track total payments received in real-time and view payment history for each unit. Send monthly rent reminders to residents and answer any payment related questions through the Payments chat channel. Automate daily, weekly, monthly tasks and communications for execution and follow-up. Assign tasks to team members to stay on top of all property management needs. Meet our brand new Community Events feature. 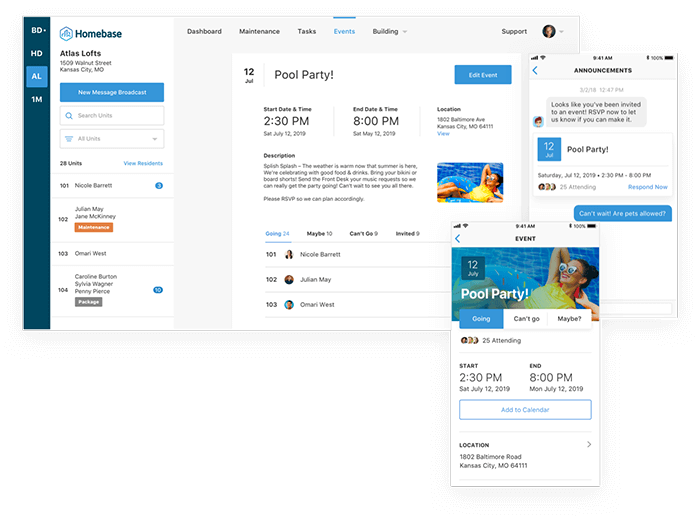 Property managers now have the ability to create community events and invite residents through the Homebase Resident App. Residents will receive an invitation through the Announcements channel and have the ability to RSVP, letting property managers know exactly who is coming to each event. 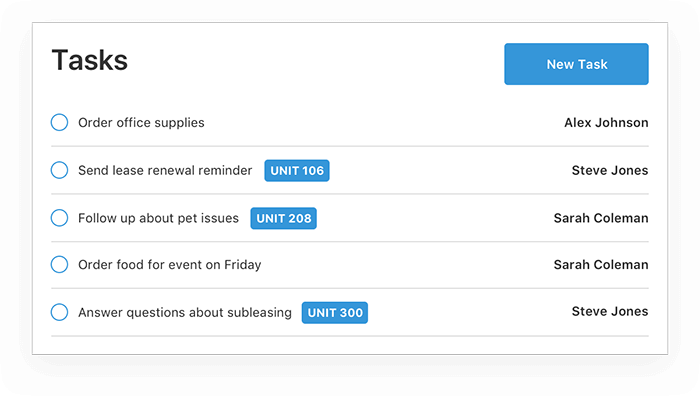 Invites and reminders can be scheduled ahead of time to give property managers true event automation. Receive and track all packages in your possession to ensure nothing is lost. 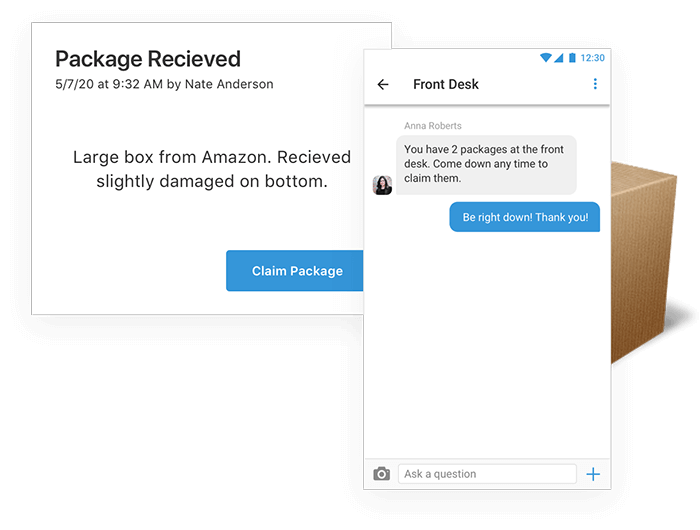 Residents will automatically receive a message notifying them of each package that is checked in.